After my dad (1995) and step-mother (1999) passed away, I spent some time cleaning out the house I grew up in, and found a cache of recipes my father had clipped from various newspapers over the years. My step-mom tended to be the meat and potatoes cook of the house, but my father loved to bake. (I just used his Kitchen-Aid standing mixer today). I kept the recipes that sounded interesting, scanned them, and I’ve worked my way through most of them over the years. This is one of those recipes. If I were to guess, its probably from the San Francisco Chronicle, sometime in the last 1980’s. I’ve found identical versions of it on the internet, with no original credit given, so who knows how long its been around. Given my recent experiments with flour corns, I’ve recently become kind of obsessed with these pancakes. They will be more or less thin, depending on the kind of corn flour you use, and how long you let the batter sit before you pour it. The original recipe made them small, just 2 tbsp of batter per pancake. But make them as big or small as you like. As you can see, I tend to like mine on the larger side. Just make sure they are cooked through the middle before you flip them. Put the cornmeal into a small mixing bowl and pour the boiling water over it, stirring briskly until well blended. Mix flour, salt, sugar and baking powder in separate larger bowl. Add beaten egg, melted butter, milk, and your cornmeal mixture. Using a whisk to break up lumps, mix thoroughly. Heat a griddle over medium-high heat. Film the griddle with oil or butter. Pour batter into 3″ diameter pancakes (supposedly makes 2 dozen if you make them this small), or larger if you prefer. Cook until bubbles break on top of the pancake and air holes remain for a second before filling in, then flip. Cook another few minutes, or until the bottoms of the pancakes are lightly browned and set. Serve hot with fresh jam, maple syrup and/or a fried egg on top. 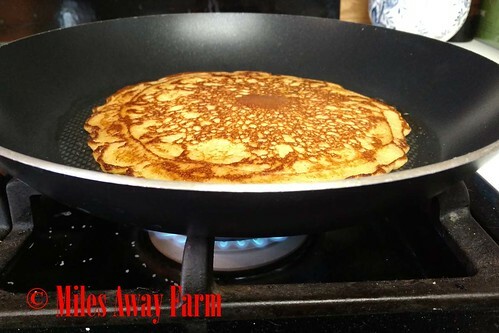 Miles Away Farm Blog © 2016, where its finally officially winter, with temperatures down to 10 degrees at night, and a skiff of snow on the ground, and these are a perfect winter hibernation food. This is from The Breakfast Book and is one of my favorite pancake recipes. Thanks Kim. Great to know. Based on the publication, “The Breakfast Book”, Marian Cunningham and Donnie Cameron, 1987, that seems spot on.